Breastfeeding rates in the United States are significantly lower for black mothers than for white mothers. Black mothers are nine times more likely to be given formula at the hospital than white mothers. This discrepancy is especially troubling given that black infants have higher rates of prematurity and infant mortality than white babies, and breastfeeding could help. 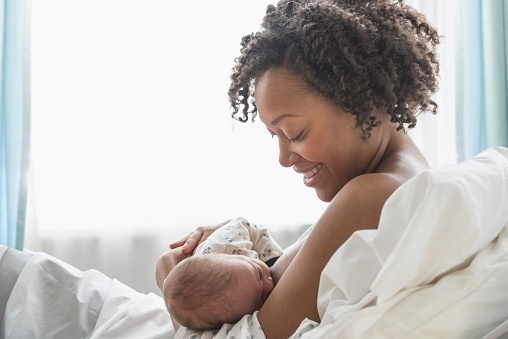 As the nation grapples with a long history of racial inequality and persistent forms of structural racism, we need to add breastfeeding to that list as well. All mothers deserve to have the education, resources, and support necessary for breastfeeding. One of the places working to make this a reality is the University of Cincinnati Medical Center. Cincinnati has one of the highest rates of infant mortality in the country. Thanks to a dedicated Lactation and Women's Health Team, they're committed to offering community education for traditionally underserved mothers, and making sure that any mother who visits the hospital has access to private and dignified spaces to pump breast milk or breastfeed. Assistant Chief Nursing Officer, Ruby Hemphill-Crawford, is leading the charge, first by certifying UCMC as a designated baby-friendly hospital, and second by ensuring that all patients, guests, faculty, and staff have a clean and dignified space to pump or breastfeed with Mamava pods. Mamava is proud to partner with mama-focused companies like Tommee Tippee and UC Health because our mission is to ensure breastfeeding is a right for all mamas, rather than a privilege for the few who have access to the support, time, and space. We're committed to making sure that mamas have everything they need to continue breastfeeding. Our pods provide a dignified space to pump or breastfeed and our mobile app empowers mamas to find those places wherever they go.